Whereas the last three-part Clone Wars arc, despite some excellent elements, never seemed to fully justify taking numerous episodes to unfold, this next set of three episodes–3.10, “Heroes on Both Sides,” 3.11, “Pursuit of Peace,” and 2.15, “Senate Murders” (remember, I’m watching in chronological order)–more than makes up for it with an arc that is complex, meaty, twisty, and perhaps most importantly, gives us a newer, deeper perspective on the wars around which the series revolves. Never before has the situation seemed so morally gray, nor the Republic so fundamentally broken. According to Lucasfilm, “Heroes on Both Sides” occurs at least a year after the previous episode, one of the sole physical clues on screen here being that Anakin’s hair is longer than it was when we last saw it, and while this might seem to be a negligible, completely insignificant detail on another show, here the change in haircut is downright ominous, because he is starting to look more and more like he does in Revenge of the Sith. This visual cue reminds us that those tragic events are steadily approaching, and that we are now drawing dangerously closer to the fall of the Republic. And significantly, in the same scene that we first notice Anakin’s longer locks, he has a political argument with Padme over the Separatists and the necessity or lack thereof for the war. Idealistically, they seem to be growing even further apart, despite themselves. The ironic thing is that he of all people is the one actually arguing against moral gray areas here. To him, the Separatists are the enemy. He has fallen for Palpatine’s war hook, line, and sinker. Padme, on the other hand, wishes the war had never happened in the first place, and although we have gotten indications before that she wanted it to end, this is the first time, as far as I can recall, that it was so clear that she truly believes that it never should have begun and that, unlike most of her compatriots, Padme doesn’t at all vilify the Separatists. In fact, one of her dearest and oldest friends, Mina Bonteri, is a Separatist, and when we finally meet her and her son via Padme and Ahsoka, we learn that not only are many of the Separatists kind, decent people, but that many of them have legitimate grievances against the Senate, whose greed and corruption we have seen numerous times throughout the series but which has never felt quite as all-pervasive as it does in this set of episodes, in which the shadier elements of government, guided by Palpatine, push for a bill to deregulate the banks so that the Republic could borrow more money it doesn’t have so that it can order a huge expansion of the Clone troops. The links between the Galactic Senate and modern-day America have also never been more apt, nor has this space fairy tale ever felt quite so much like social-commentary-based science-fiction. 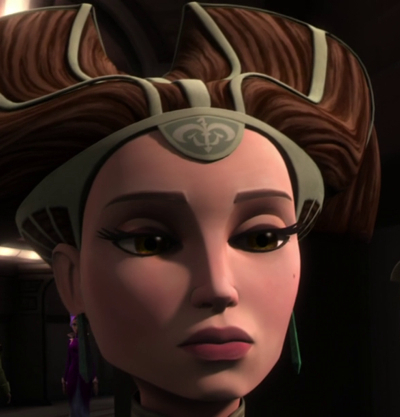 It’s also fascinating that Ahsoka is the one to join Padme on her secret trip, and that she also begins to learn for the first time that, from a Separatist perspective, even the Jedi can be seen as enemies for upholding the rules of a sick and morally bankrupt Republic over the interests of the common people who want representatives who aren’t bought and sold by large corporations. Additionally, this lesson comes in the form of a boy that she seems to start liking and could potentially, under very different circumstances, have had a romantic future. The episode also pointedly reminds us of the true human (for lack of a better word, since many races have suffered) toll of the Clone Wars. One thing we might not have thought about in the past is that, although almost all of the battles we have seen have been between the Clones and battle droids, there are Separatist troops composed of humans and other organic, sentient creatures, as well, who have died for what they believe in. Now, the reason that sort of battle doesn’t tend to be depicted on screen is that seeing human/etc. troops wiping each other out would be far too viscerally real and horrific either for an animated series with a large child audience or for the tone of the Star Wars series in general, but this episode establishes that there are real Separatist people dying, not just droids, and that many of them want the war to end, too. The problem is that they don’t know that their leader, Dooku, is actually a Sith Lord, and that their war has actually been set off by the current head of their supposed enemy, in order to destabilize the entire galaxy and make it easier to conquer them all when the time comes. This is bitterly reiterated at the end of the first episode, when Dooku instigates an attack against Coruscant, designed by Palpatine to inspire the Senate to want to escalate the war, rather than begin peace talks for which Padme had secretly negotiated. And, as we learn in the very next episode, Dooku immediately thereafter has Mina assassinated, to further galvanize the Separatists against the Republic, as well. The war is being manipulated from both sides, which is, unbeknownst to anyone but Palpatine’s closest confidantes–such as the Vice Chancellor, Mas Ameda (who we learn for the first time here, at the end of “Pursuit of Peace,” is in on it, as well)–actually the same one, all at the mercy of one grand puppet master.